We currently have 19 sites in the UK and this will increase by a minimum of 20 sites each year. 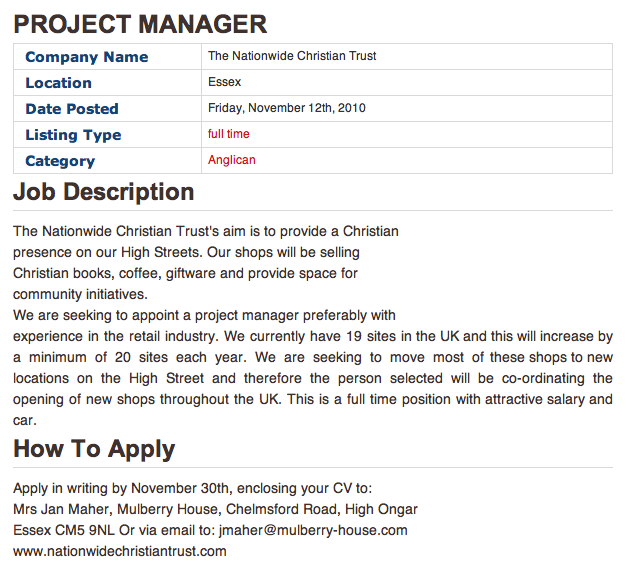 The Nationwide Christian Trust’s aim is to provide a Christian presence on our High Streets. Our shops will be selling Christian books, coffee, giftware and provide space for community initiatives. We are seeking to appoint a project manager preferably with experience in the retail industry. We currently have 19 sites in the UK and this will increase by a minimum of 20 sites each year. We are seeking to move most of these shops to new locations on the High Street and therefore the person selected will be co-ordinating the opening of new shops throughout the UK. This is a full time position with attractive salary and car. Given that plans for the Croydon store have apparently been placed on hold, aiming to grow the business “by a minimum of 20 sites each year” seems a tad overambitious and begs the question of whether the ad is a casualty of Chinese Whispers: should it not rather state “We currently have 19 sites in the UK and this will increase to a minimum of 20 sites this year”? If, on the other hand, the plan is indeed to expand operations “by a minimum of 20 sites each year” then important questions need to be asked both by anyone considering applying for the post and by the wider trade — what, for instance, is Living Oasis’ view of the wider trade? Is the plan to reach out into towns where there is not already a Christian presence on the high street — or to establish branches of Living Oasis in direct competition with existing Christian bookshops? To plant or to supplant? Up until now, many of the struggling Christian bookshops have retained a very narrow focus, namely they have simply focussed on Christian books and resources, and hereby the predominance of customers have been Christians. This has greatly reduced their viability on the High Street because no matter how attractive the shop front, and no matter how well laid out the stock is, the fact remains, there is little reason why people would chose to go in. Without doubt there are some Christian bookshops with an especially narrow focus (see the reviews posted by Mr Charmley to get a feel for the variety of Christian bookshops out there) but as a sweeping generalisation, it simply isn’t true: the vast majority of Christian bookshops aim to serve as wide a marketplace as their remit permits, and the ideas being put forward by Living Oasis such as incorporating a café or offering use of premises to local churches/parachurch organisations outside of normal opening hours are nothing new. Last but not least, I personally remain mystified by what appears to be a contrary vision: to provide a Christian presence on the high street whilst simultaneously “de-Christianising” the shop windows. Which is it to be? Undercover evangelism or an identifiable Christian presence? Picked this up a few weeks late, but a comment that 20 shops a year sounds wildly optimistic to me. Having done a few shop opening projects in my previous ‘life’, I think this particular job sounds very, very difficult- a private helicopter would be much more use than a company car….. We shall wait & see! !